It is an unrealized dream of Wadhwan’s king Dajirajji. He wanted to replicate Jaipur’s Hawa Mahal in Wadhwan, but due to his untimely death, his desire could not be fulfilled. This palace in an unfinished state still stands, talking with the space. It is just 7kms from Surendranagar District Headquarters. The temple complex covers an area of 13,190 sqft, while the temple podium is 5,656 sq ft. The entire complex is surrounded by a lush, green garden with benches, as well as a beautiful fountain at the centre. The temple also has an informative museum and mini-theater on GnaniPurushParamPujya Dada Bhagwan, around whose vision the Trimandir has been built. His aim was to remove the differences between religions and further to bring religions back to the seat of the Soul. Building a non-sectarian temple was one of the ways that His vision is being fulfilled. The museum has approximately 30,000 visitors in a year. 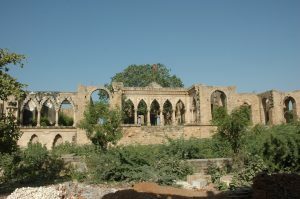 Chotila is a small town having population of around 20,000 people and is a taluka head quarter of Surendranagar district, Gujarat. The Mataji temple is situated at the top of the Chotila Mountain. 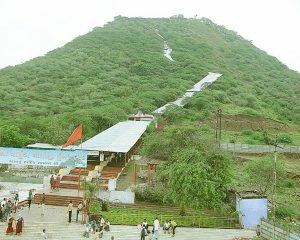 Chotila Mountain is around 1250 feet high and is located around 40 miles away from Rajkot, and around 50 miles away from Ahmedabad. The story is when Demons Chand and Mund came to conquer Devi Mahakali and in the fight that ensues, the Devi cut their heads and presented these to Maa Ambika, who in turn told Mahakali that will be worshipped as Chamunda Devi. 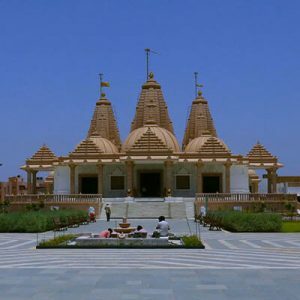 Varnindra Dham Swaminarayan Temple is beautiful temple located at Patdi via Viramgam, Gandhinagar Highway , Malvan Chokdi Patdi in Dasada taluka, Surendranagar District. 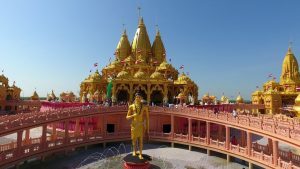 The temple is second part of Nilkanthdham Swaminarayan Temple in Poicha. Here is some Fact about Varnindra Dham Swaminarayan Temple in Patdi.